This book is a must read for anyone wanting to seriously study the doctrine of the baptism in the Holy Spirit. 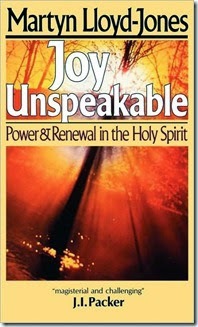 If you want a well-rounded view of the subject and want to learn from all sides of the debate, you simply cannot pass by "Joy Unspeakable". Lloyd-Jones is in an unique position to write on this topic since he is one of the most celebrated Reformed preachers of all time. Lloyd-Jones sees himself as defending the "old evangelical" view of the Holy Spirit against the modern view of his day which equated the baptism in the Spirit with regeneration. Whether Lloyd-Jones is correct about this or not is for you to decide. Lloyd-Jones cannot be categorized with the Pentecostals, nor with the non-Pentecostals. For example, he argues in favor of Pentecostalism that the baptism in the Spirit is a subsequent and distinct experience from conversion. It is experiential and comes with evidences. However, also he argues against Pentecostalism that the evidences of the baptism in the Spirit have nothing to do with the gifts of the Spirit such as speaking in tongues. Nor does he agree with the Holiness camps that the baptism in the Spirit has to do with sanctification. He strongly denies this. Lloyd-Jones contends that the chief end of the baptism in the Spirit is to bring Christians assurance, which is the indispensable power to be witnesses of Christ. Therefore the evidences of the baptism in the Spirit will be a man empowered with assurance. Lloyd-Jones argues that the baptism in the Spirit is not something one can work up or make happen, but rather that it is a sovereign work of God to happen in His timing and in His way. He emphasizes this greatly. It is not something man initiates, but something God initiates. It is not us doing things to fill ourselves with the Spirit (as in Ephesians 5:18, which Lloyd-Jones calls the normal way), but it is something different. The Spirit "falls on" people, and it is exceptional, an experience they do not make happen. Throughout the book Lloyd-Jones repeatedly uses examples from history, seeking to prove his points not only from Scripture but from the lives of saints who have claimed a distinct experience with the Spirit. It sometimes struck me that what Lloyd-Jones is calling the baptism in the Spirit is nothing more than when a Christian catches a glimpse of the glory of the truth of the gospel. It is that experience that many of us have had that only seems to last for a brief moment, when you are overwhelmed with emotion due to a more vivid sight of the truth. Finally, Lloyd-Jones is greatly concerned with the need for revival in the Church. He inseparably connects one's doctrine of the baptism in the Spirit with one's doctrine of revival. If you believe the baptism in the Spirit to be indistinct from conversion, you will therefore not believe in revival. To Lloyd-Jones, the Pentecostal experience is essentially revival, and vice versa. Revival is when God pours His Spirit upon the Church, giving them fresh power to proclaim the gospel. This book is full of strengths and weaknesses. It is greatly challenging. It hardly deals with spiritual gifts. It constantly asks you to examine your own Christian experience. It doesn't fully satisfy the exegetical questions. However, the best part about Lloyd-Jones is that he actually attempts to prove his position from the Scriptures. He does not just say, as many do, "I can't explain it, you just have to experience it for yourself." Thankfully, Lloyd-Jones gives us more than that. While I do not fully agree with Lloyd-Jones's conclusions, I consider this book an excellent contribution to the study of the Spirit. Want to wrestle with the doctrine of the baptism in the Spirit? You must at least read this book. I couldn't disagree more with your evaluation of MLJs book, Joy Unspeakable. He approached the subject with an already full conclusion, which was not arrived at via exegeting the scripture, but via generalizations, incorrect suppositions, unusual experience of others, even reverting to quoting heretical teachers and leaders of the past. Because of his status and the fact that most readers of this book are not discerning, those reading this book will be potentially lead to serious error. I would not recommend this book.